Chronic Radiation Hazards: An Experimental Study with Fast Neutrons describes a large-scale experiment on the hazards to be expected from low and very low levels of chronic irradiation by fast neutrons. Fast neutrons may be an environmental hazard around nuclear reactors and some machines for accelerating particles, and it is therefore of practical as well as academic importance to get some idea of the likely ill-effects of chronic irradiation by fast neutrons. The book is organized into four parts. 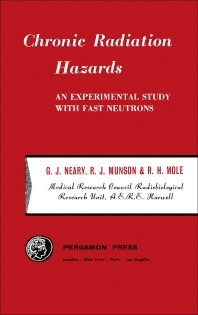 Part I describes the experimental design, including factors such choice of animal, choice of dose rate, observation of radiation effects, dose measurements, and energy of the neutrons. Part II deals with the measurement of fast neutron dose. Topics discussed include Interaction of neutrons with light elements; energy absorption due to fast neutrons; energy absorption due to gamma rays; and ionization-dose and ionization-flux relations for fast neutrons. Part III discusses the results of fast neutron irradiation while Part IV covers the relative biological efficiency of fast neutrons and gamma rays for chronic exposures.